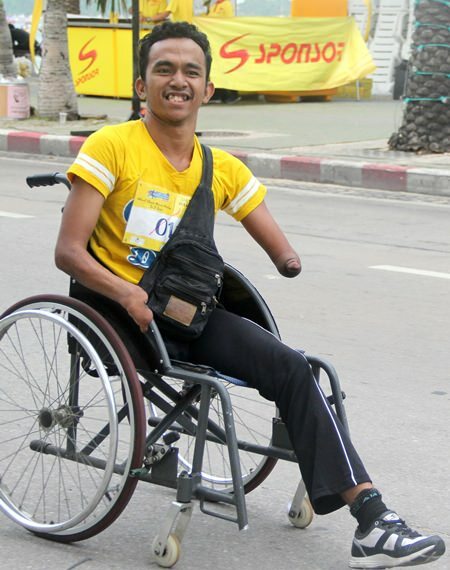 In past years the annual Pattaya Marathon included a full wheelchair race, 42kms in length, and each year it drew an impressive array of athletes from around the world. 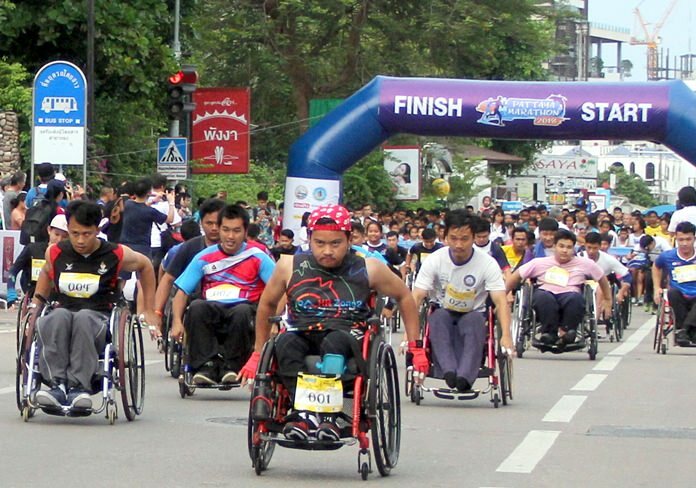 Recently the full wheelchair marathon has been replaced with a 3.7km fun race, and this year thirty nine athletes took part. The length of the race may not seem far, but for most of those who took part it was their first time they were racing. They raced down Beach Road, and then up towards Dolphin Roundabout; which may not seem steep but try wheeling yourself up there and it’s not as easy as you may think. Then along Second Road, turning left on Pattaya Klang and over the finish line back on Beach Road in front of the Hard Rock Hotel. Waiting at the finish line to welcome them back was Mayor of Pattaya, Pol. Maj. Gen. Anan Charoenchasri, who congratulated them on completing the race. 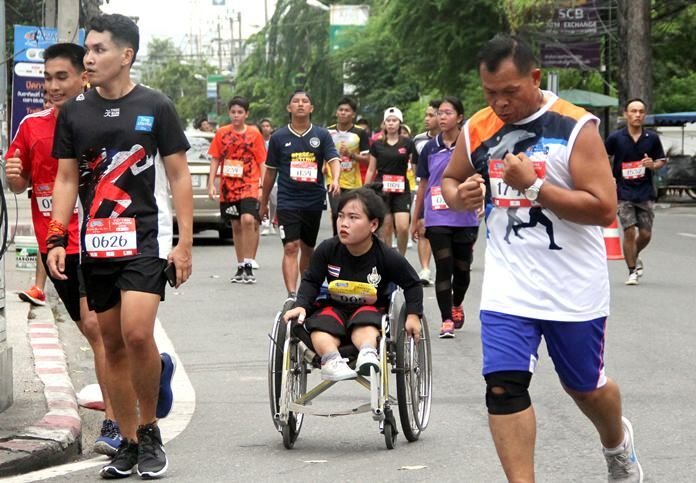 The majority of those taking part are students at the Pattaya Redemptorist Technological College for People with Disabilities, with the exception of the winner of the race, Sungkeek Sripraram from Bangkok, who took away the first prize of 8,000 Baht. 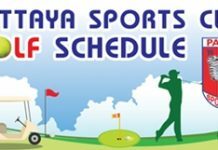 Pattaya Mayor, Pol. 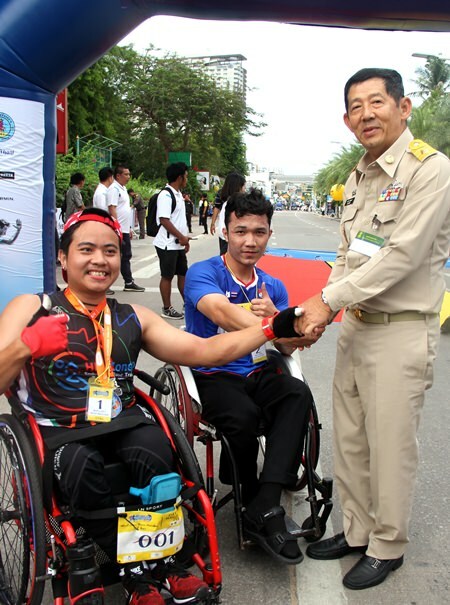 Maj. Gen. Anan Charoenchasri (right) congratulates race winner Sungkeek Sripraram (left). One of the several female racers who took part. Always time for a mid-race smile for the camera.